Over the last few years we’ve been repeatedly reporting how Samsung was able to improve AMOLED power efficiency by employing better emitter materials on each new device generation. This went largely unverified as nobody really tried to accurately measure the actual power consumed by the screen. To rectify this situation, I went ahead to try to measure the screen power consumption of the last 4 generations of Galaxy S devices to get a better understanding just how much emitter improvements have contributed to screen and device battery efficiency. AMOLED screens are emissive displays, meaning they emit light on their own without having to resort to backlights in transmissive technologies such as LCD screens. This causes white to be the most power-intensive color for an OLED screen to display because it requires all sub-pixels to operate at high emission. The advantage of OLED screen though is that for dynamic content, the technology is able to save power in comparison to transmissive displays because only the pixels which are actually used are powered up. Because white is a worst-case power scenario, it serves well as good representation of general efficiency gains in OLED devices. I've noticed that the power composition of the display consists of the sum of individual component’s power, and was able to verify this on the Galaxy S6: the sum of pure red, green and blue (in sRGB) was largely correlating with the power consumption of pure white when you take into account APL (Average Picture Level) brightness adjustments of the display. Immediately the Galaxy S4 sticks out as the most power consuming device of the last few generations. One has to keep in mind that most of this power is not due to the display itself, but due to the lack of Panel Self Refresh on past generation devices. PSR is able to achieve better power efficient in static screen scenarios by not re-sending frame-buffer information to the screen’s display controller IC. The DDIC instead buffers the screen contents on-chip and refreshes the screen matrix that way, enabling the SoC’s display controller pipeline to shut down and save on power. Due to inconsistencies in SoCs, DDICs and general component efficiency, each device starts at a different power value at minimum brightness. For example the Galaxy S5 is able to post by far the best value in this metric as it will consume down to 258mW while idling at minimum brightness. 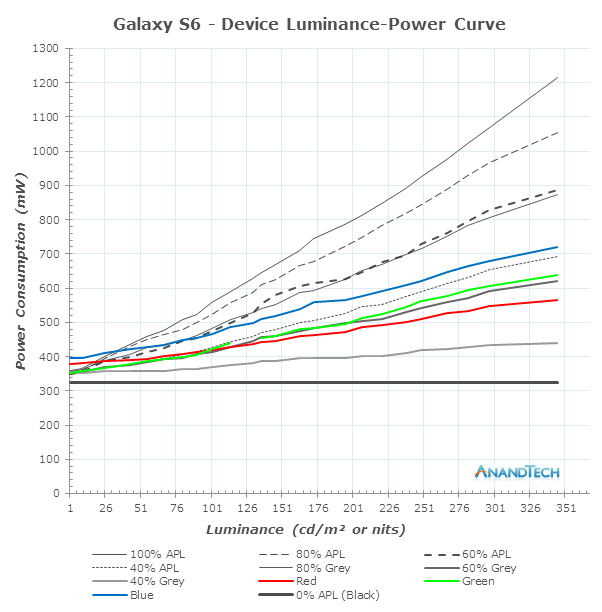 The Galaxy S5 LTEA and Galaxy S6 will use a tad more at around 360mW each. This is likely due to the fact because of the heightened resolution of their 1440p screens compared to the 1080p screen on the Galaxy S5. We see a generational improvement in power efficiency for each new Galaxy S device, except the S5 LTEA. It seems that the switch to 1440p effectively brought itself with a loss in efficiency of the screen and the DDIC / base power consumption. We don’t know the details of the emitter materials used for each generation, but I’ve been told that power efficiency of a sub-pixel should theoretically go down relative to its size. The higher DPI density of the S5 LTEA might be reason for its efficiency degradation. 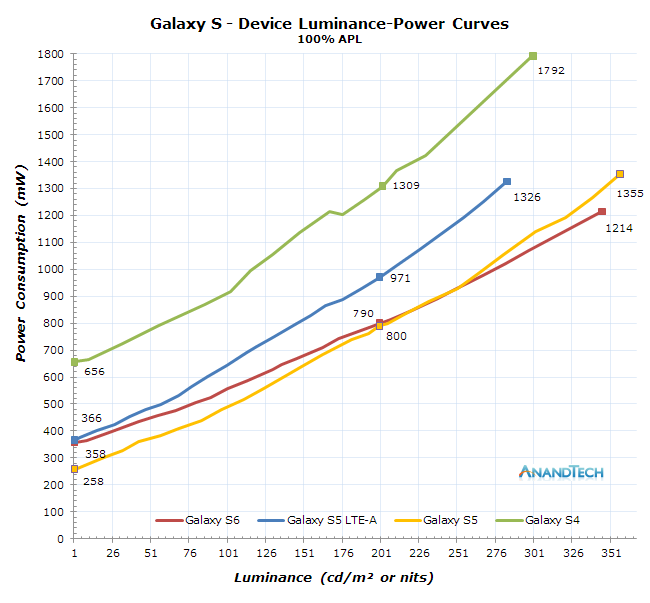 The Galaxy S6 offers the best evidence of new emitter and efficiency gains as it is even clear in the luminosity curve graph how even though the S6’s base power consumption is higher, it is able to catch up this to this difference and surpass the Galaxy S5 at higher brightness levels. The comparison with the S5 LTEA is the most interesting as both devices sport a 5.1” 1440p display making them perfect for an apples-to-apples comparison. Here the S6’s new display is able to exhibit a substantial 36% improvement in power efficiency. While the generational power efficiency gains compared to older AMOLED devices is interesting, the question remains if the newest displays are now able to match up to LCD panels in terms of efficiency at high APL values. To get a better idea how power scales depending on APL, grey-scale various colors, I went ahead graphed over 239 measurement points on several display scenarios on the Galaxy S6. As expected, we see white being the obvious most power consuming color as it requires high intensity on all color components. We again see the interesting behavior of black and white patterns summing up to a certain %APL consume much more power than an equal grey-scale or mixed image at the same APL. As explained in our review of the Galaxy Note 4 Exynos, this is due to voltage scaling of the intensity levels of the sub-pixels. Actual brightness of the display is controlled by pulse wave modulation on top of the component voltage scaling mechanisms. I’ve yet to measure more LCD devices to get a better picture of various panel manufacturers and screen technologies, but if we take for example the Huawei P8’s panel we can calculate a luminance-power of 332mW at 200cd/cm². Over the Galaxy S6’s AMOLED screen this still represents a 33% advantage for the LCD technology when displaying white and high level greyscale colours. To reach an equivalent amount of efficiency on the S6 one would have to have about less than 65-70% of solid white in the picture. Unfortunately Android interfaces are still dominated by high APL and white elements, so AMOLED will still trail LCDs in most default UI scenarios when it comes to luminance power. As long as white is avoided, the S6 can already claim it is more efficient than LCD devices in all other scenarios as the break-even point now reaches ~85% greyscale. The good news though is that this gap keeps decreasing with each generation and the disadvantage is limited to pure white background content. Having even slightly grey or colored content will start shifting the scales back in favour of AMOLED devices. Running dark themes and dark backgrounds can really be advantageous for AMOLED device as they are able to achieve factors of 3-4x in luminance-power advantage over LCD devices. I would say that Samsung still needs to achieve another 15-20% improvement in power before AMOLED is consistently more efficient than LCD devices in even the worst-case APL and high white-percentage scenarios. Given the last generational improvements and if Samsung keeps resolution constant, this seems to be an achievable goal for next year as long as emitter research and development continues to advance at the current pace.